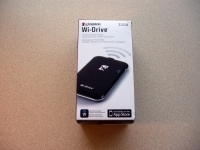 The packaging for the Kingston Wi-Drive 32GB wireless flash storage device is shown in the images below. The box is rather compact, and is just barely larger than the device inside in both length and width, and just a couple inches high. The front of the box provides a general idea about what the device's capabilities, confirms the 32GB capacity, and details that an App is available from the App Store to make accessing the device easier from your Apple product. The back of the box is covered in fine print that is provided in a variety of languages. The image below shows everything you get. 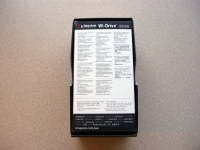 Besides the box, there is a "Getting Started" manual, an AC power adapter, a USB cable used for data transfers as well as for AC or computer based charging, and the Wi-Drive itself (still shown wrapped in a protective sleeve of foam). 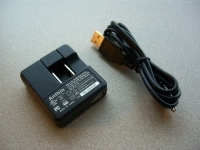 The next image provides a close-up of the AC adapter and USB cable. The USB cable can connect to the AC adapter for charging at home, as well as being used on its own for charging off of any powered USB port. It would have been nice to also find a 12V adapter for car charging.